Further actions need discussion and coding by Center members. The Chair will then create a vote. 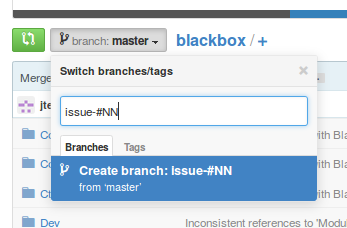 If the vote passes, the topic branch should be merged with the master branch in the web-interface of GitHub. 3. Make changes and commit them with some message containing description + "Refs. #N."
git commit -a -m "The description. Refs. #N."
The repository contains only sources, so for editing at the third step you need to use other copy of BlackBox or to build BlackBox from sources using the instructions from README file. More information can be found here: How to develop with Git. However this work is not necessary, you can just post the annotated solution in the forum and the admin of Chair will execute this. This page was last modified on 27 April 2016, at 02:39.